When I was contacted by Wendy of The Little Shanti Yoga Studio about children's yoga classes, I was certainly intrigued, but not very sure my robot-loving, samurai-kick-throwing 3-year-old would be very into following yoga directions. Boy was I wrong! Andrew had a great time and it is all due to Wendy and her super fun teaching style. 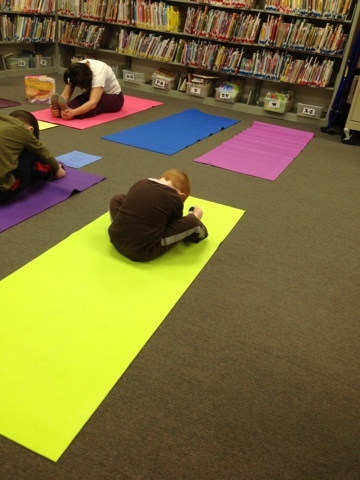 During our yoga session at the Rose Memorial Public Library, Wendy based the class around an adorable picture book about feelings. She began the class by asking the kids to draw a picture of how they were feeling that day, and everyone then spoke a bit about their drawing. Next, she read a few pages from the book and followed that with a couple minutes of yoga, repeating the cycle (read, yoga, read, yoga) for the rest of the class. The kids, ranging in age from about six to three, were captivated by Wendy's animated storytelling and did such a good job keeping up with the kid-friendly yoga moves. 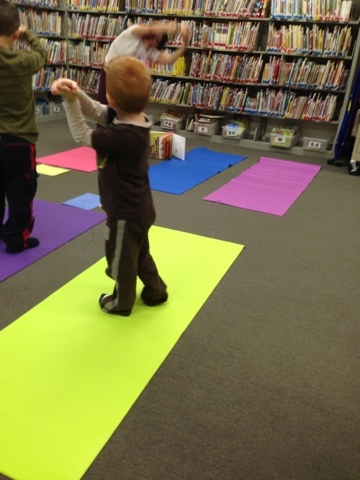 And, while Andrew especially kept wanting to interrupt the class with stories about robots, Wendy was so amazing at bringing each interruption kindly and quickly back into the yoga routine. We can thank her years as a preschool teacher for that useful skill! It was so nice to see Andrew being active in such a healthy and quieter way, and I am definitely going to be joining Wendy for more classes in the future. You can check out the Little Shanti website or Facebook page for more class times, locations and pricing info. Wendy teaches from her home close to Suffern, travels to local schools and other venues, and also does private classes and birthday parties for kids and adults, so there are so many, many fun ways your family can get started!